Using techniques to measure light across a wide range of the electromagnetic spectrum, including radio, optical, ultraviolet, and X-rays, astrophysicists study the life cycle and evolution of galaxies. Many answers to questions about the life cycle of galaxies lie in the vast gaseous envelopes surrounding the brilliant spirals and spheroids composed of stars, and can be investigated through a clearer understanding of the composition and physical state of these gaseous envelopes (or circumgalactic medium, CGM). The Intergalactic Medium Visualization, or IGM-Vis, presents data gathered via Hubble Space Telescope measurements in order to facilitate the analysis of IGM and CGM data. 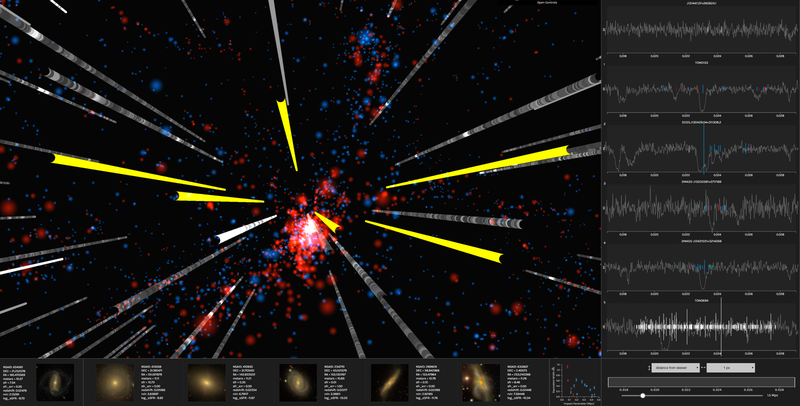 It was developed by researchers from UCSC Creative Coding in collaboration with astrophysicists from UCSC’s Astronomy & Astrophysics Department. An article describing the project— authored by Joseph N. Burchett, David Abramov, Jasmine Otto, Cassia Artanegara, J. Xavier Prochaska, and Angus Forbes— is available on arXiv. Deep Illumination is a novel machine learning technique for approximating global illumination (GI) in real-time applications using a Conditional Generative Adversarial Network that can generate indirect illumination and soft shadows with offline rendering quality at interactive rates. Inspired from recent advancement in image-to-image translation problems using deep generative convolutional networks, we introduce a variant of this network that learns a mapping from G-buffers (depth map, normal map, and diffuse map) and direct illumination to any global illumination solution. That is, we show that a generative model can be used to learn a density estimation from screen space buffers to an advanced illumination model for a 3D environment. Once trained, our network can approximate global illumination for scene configurations it has never encountered before within the environment it was trained on. We evaluate Deep Illumination through a comparison with both a state of the art real-time GI technique (VXGI) and an offline rendering GI technique (path tracing). We show that our method produces effective GI approximations and is also computationally cheaper than existing GI techniques. The paper describing the technique, authored by Manu Mathew Thomas and Angus Forbes and titled “Deep Illumination: Approximating Dynamic Global Illumination with Generative Adversarial Networks,” is available on arXiv. Text Annotation Graphs, or TAG, provides functionality for representing complex relationships between words and word phrases, including the ability to define and visualize relationships between the relationships themselves (semantic hypergraphs). Additionally, we include an approach to representing text annotations in which annotation subgraphs, or semantic summaries, are used to show relationships outside of the sequential context of the text itself. Users can utilize these subgraphs to quickly find similar structures within the current document or external annotated documents. TAG was developed to support information extraction tasks on a large database of biomedical articles. However, our software is flexible enough to support a wide range of annotation tasks for any domain. TAG was developed by Angus Forbes and Kristine Lee in collaboration with the Computational Language Understanding Lab (CLU Lab) at University of Arizona. NeuroCave is a novel immersive analytics system that facilitates the visual inspection of structural and functional connectome datasets. The representation of the human connectome as a graph enables neuroscientists to apply network-theoretic approaches in order to explore its complex characteristics. 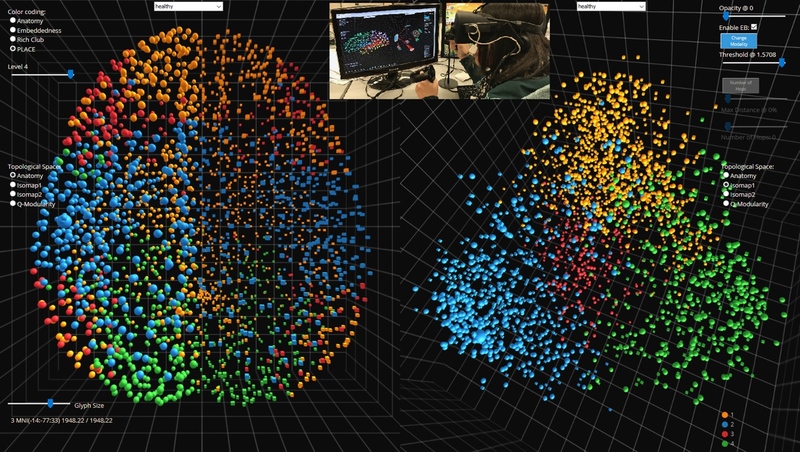 With NeuroCave, brain researchers can interact with the connectome— either in a standard desktop environment or while wearing portable VR headsets (such as Oculus Rift, Samsung Gear, or Google Daydream VR platforms)— in any co-ordinate system or topological space, as well as cluster brain regions into different modules on demand. Furthermore, a default side-by-side layout enables simultaneous, synchronized manipulation in 3D, utilizing modern GPU hardware architecture, and facilitates comparison tasks across different subjects or diagnostic groups or longitudinally within the same subject. Visual clutter is mitigated using a state-of-the-art edge bundling technique and through an interactive layout strategy, while modular structure is optimally positioned in 3D exploiting mathematical properties of platonic solids. NeuroCave provides new functionality to support a range of analysis tasks not available in other visualization software platforms. NeuroCave was developed in collaboration with the Collaborative Neuroimaging Environment for Connectomics (CoNECt@UIC), and first presented at NetSci 2017, the International School and Conference on Network Science. Force-directed techniques are used to automatically generate interactive visualizations of node-link relationships. However, there are numerous issues when using them to represent large networks, such as scaling, visual clutter and abstracting meaningful information. In this project, we apply force-directed networks to a biological system and explore various techniques that can be used to help alleviate the issues faced in larger force-directed networks. The Kappa Simulator (KaSim), developed by Walter Fontana, is a rule-based language and stochastic simulator used for simulating protein interaction networks. Our visualization tool, DIN-Viz, developed by EVL students Kristine Lee, Xing Li, and Andrew Burks (in collaboration with Fontana’s research group at Harvard Medical School), represents the results of these simulations in order to help scientists better understand the stochastic biological systems they are modeling. Source code can be found at the UCSC Creative Coding code repository. Current authoring interfaces for processing audio in 3D environments are limited by a lack of specialized tools for 3D audio, separate editing and rendering modes, and platform-dependency. To address these limitations, we introduce INVISO, a novel web-based user interface that makes it possible to control the binaural or Ambisonic projection of a dynamic 3D auditory scene. Specifically, our interface enables a highly detailed bottom-up construction of virtual sonic environments by offering tools to populate navigable sound fields at various scales (i.e. from sound cones to 3D sound objects to sound zones). Using modern web technologies, such as WebGL and Web Audio, and adopting responsive design principles, we developed a cross-platform UI that can operate on both personal computers and tablets. This enables our system to be used for a variety of mixed reality applications, including those where users can simultaneously manipulate and experience 3D sonic environments. INVISO was developed by Anıl Çamcı in collaboration with Kristine Lee, Cody Roberts, and Angus Forbes, and was presented most recently at UIST’17. Trees are one of the most fundamental data types. However, existing tree layout techniques are not always adequate for many real-world datasets. In addition to facilitating reasoning about hierarchical relationships, many application domains require the presentation of non-hierarchical relations between data items. For example, in the domain of molelcular biology, researchers analyze intracellular signaling pathways that can be composed of deeply nested sets of biomolecules (i.e., proteins and protein complexes). When displaying signaling pathways it is also important to clearly show how particular biomolecules influence or are influenced by others. That is, it may be necessary to highlight relevant interconnections between trees or subtrees while at the same time making sure not to obscure the hierarchical information in the tree. Similarly, in the domain of biodiverstiy informatics, the hierarchical structure of a phylogenic tree can usefully be overlaid with additional information that connects nodes in the tree in order to show, for instance, properties of a food web. Many other examples can be found in real-world datasets. 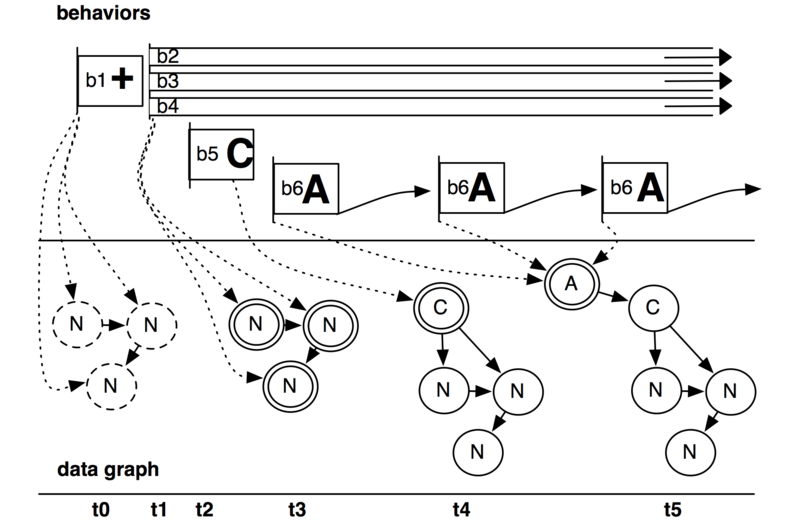 The CactusTree layout, developed by Tuan Dang in collaboration with Angus Forbes, is a novel visualization technique that supports pattern recognition and the identification of connections over hierarchical datasets. Source code can be found at the UCSC Creative Coding code repository. There are many challenges involved in creating meaningful augmented reality (AR) narratives. Interfaces for facilitating these AR experiences lack important functionality due both to technical challenges and to the difficulty of understanding ahead of time how users will respond to the various components that make up the experience. We are currently exploring effective abstractions of heterogeneous data in order to enable an appropriate spatial definition of content that can be used, for example, to effectively position virtual objects within the real-world and to clearly understand how users are behaving within an AR experience. CAVE-AR is a novel system for facilitating the design of complex AR experiences and monitoring and communicating with users taking part in the experience. Both aspects of this system rely on the use of a virtual reality (VR) interface whereby a designer is able to remotely view and interact with all aspects of the AR experience, including 3D models of architecture, maps of the environment, live camera views, and rich sensor data from each participating player. Our system enables a designer to see what players are seeing, leading to new ways to interact with the players in real-time and to monitor and modify their experience. 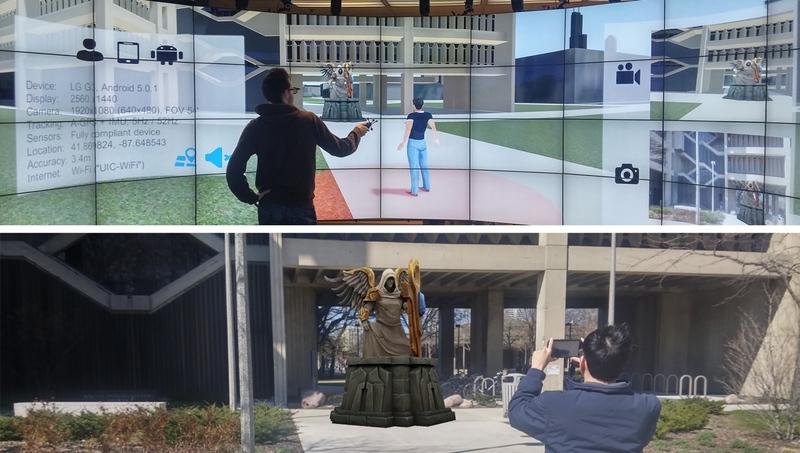 CAVE-AR has been used to design a novel AR scavenger hunt game, Digital Quest, and the Chicago history AR experience Riverwalk. Understanding complicated networks of interactions and chemical components is essential to solving contemporary problems in modern biology, especially in domains such as cancer and systems research. In these domains, biological pathway data is used to represent chains of interactions that occur within a given biological process. Visual representations can help researchers understand, interact with, and reason about these complex pathways in a number of ways. At the same time, these datasets offer unique challenges for visualization, due to their complexity and heterogeneity. We introduce a taxonomy of tasks that are regularly performed by researchers who work with biological pathway data. The generation of these tasks was done in conjunction with interviews with several domain experts in biology. These tasks require further classification than is provided by existing taxonomies. We also examine existing visualization techniques that support each task, and we discuss gaps in the existing visualization space revealed by our taxonomy. Our taxonomy is designed to support the development and design of future biological pathway visualization applications. This work, developed by Paul Murray, Fintan McGee, and Angus Forbes was presented at BioVis’16 and published in BMC Bioinformatics. TimeArcs is a novel visualization technique for representing dynamic relationships between entities in a temporal network. In many application domains, relationships between entities are not temporally stable, meaning that cluster structures and cluster memberships may vary across time. Our technique provides a big picture overview of the most significant clusters over time. It also supports a range of interactive features, such as allowing users to drill-down in order to see details about particular clusters. We have explored the utility of TimeArcs through its application to various datasets, including collocated popular phrases obtained from political blogs, the IMDB co-star network, and a dataset showing conflicting evidences within biomedical literature of protein interactions. This technique, developed by Tuan Dang in collaboration with Nick Pendar and Angus Forbes, was presented at EuroVis’16. Source code and video documentation can be found at the Creative Coding Research Group code repository. Halos in a dark sky visualizes dark matter halo merger trees and their evolution through space and time. The prototype web application enables users to interact with individual halos within these trees in order to perform a range of visual analysis tasks, including: identifying the substructure and superstructure of the halos; observing the movement of halos across a custom range of time steps; and comparing the branching attributes of multiple trees. Central to our application is the ability to navigate the halos by interactively “jumping” from tree to tree. By clearly marking halos that have “tributaries” — that is, that split off into multiple halos or merge with one or more halos — the user can traverse the complex structure of the universe. The application is publicly available online and runs at interactive rates on the browser using hardware-accelerated graphics. Halos in a dark sky, developed by Kyle Almryde and Angus Forbes, took 2nd place in the 2015 IEEE SciVis Contest, “Visualizing the Universe”. Assuming that the topological space containing all possible brain states forms a very high-dimensional manifold, this paper proposes an unsupervised manifold learning framework to reconstruct and visualize this manifold using EEG brain connectivity data acquired from a group of healthy volunteers. Once this manifold is constructed, the temporal sequence of an individual’s EEG activities can then be represented as a trajectory or thought chart in this space. Our framework first applied graph dissimilarity space embedding to the temporal EEG connectomes of 20 healthy volunteers, both at rest and during an emotion regulation task (ERT), followed by local neighborhood reconstruction then nonlinear dimensionality reduction (NDR) in order to reconstruct and embed the learned manifold in a lower-dimensional Euclidean space. We showed that resting and ERT thought charts represent distinct trajectories, and that the manifold resembles dynamical systems on the torus. 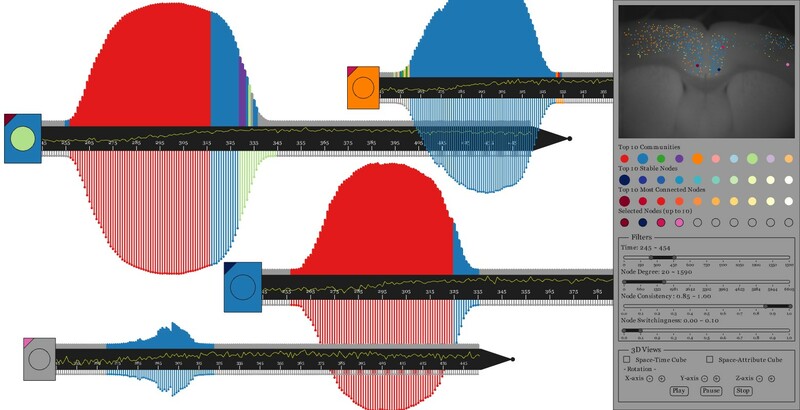 Additionally, new trajectories can be inserted on-line via out-of-sample embedding, thus providing a novel data-driven framework for classifying brain states, with potential applications in neurofeedback via real-time thought chart visualization. Thought Chart was developed by Mengqi Xing and members of the Collaborative Neuroimaging Environment for Connectomics (CoNECt@UIC), and won a best paper award at BIH’16. Real world group-to-group collaboration often occurs between partially distributed interdisciplinary teams, with each discipline working in a unique environment suited for its needs. Groupware must be flexible so that it can be incorporated into a variety of workspaces in order to successfully facilitate this type of mixed presence collaboration. This project introduces new techniques for sharing and synchronizing multi-user applications between heterogeneous large-scale shared displays. The first partitions displays into a perfectly mirrored public space and a local private space. The second enables user-controlled partial synchronization, where different attributes of an application can be synchronized or controlled independently. This work, led by Thomas Marrinan in collaboration with Jason Leigh, Luc Renambot, Angus Forbes, Steve Jones, and Andrew Johnson, was presented at ISS’16 and CSCW’17. Taxon-character matrices are one of the primary tools that biologists use to classify organisms and to study evolution. Although traditionally created by hand, newer software tools make it possible to create matrices much larger than a manual workflow could support. The size of these matrices demands novel visualization techniques that are scalable and that support the curation, management, and exploration of large taxon-character matrices and their derivatives (e.g. character-character matrices). An obvious way to visualize character-by-character similarity is by using an adjacency matrix where the color in each cell encodes the similarity of each pair of characters. However, this approach does not scale well due to the size constraints of a typical computer screen. To mitigate this scalability issue, we can provide a high-level abstraction of the original matrix. Rather than drawing every single cell, we hide certain fine-grained details of the original matrix at higher levels while still enabling a user to interactive view these details on demand. MultiLayerMatrix is a new scalable technique to visualize very large matrices by breaking them into multiple layers. The top layer shows the relationships between different groups of clustered data while each sub-layer shows the relationships between nodes in each group as needed. This process can be applied iteratively to create multiple sub-layers for very large datasets. MultiLayerMatrix, developed by Tuan Dang in collaboration with Hong Cui and Angus Forbes, was presented at EuroVA’16. Source code can be found at the Creative Coding Research Group’s code repository. 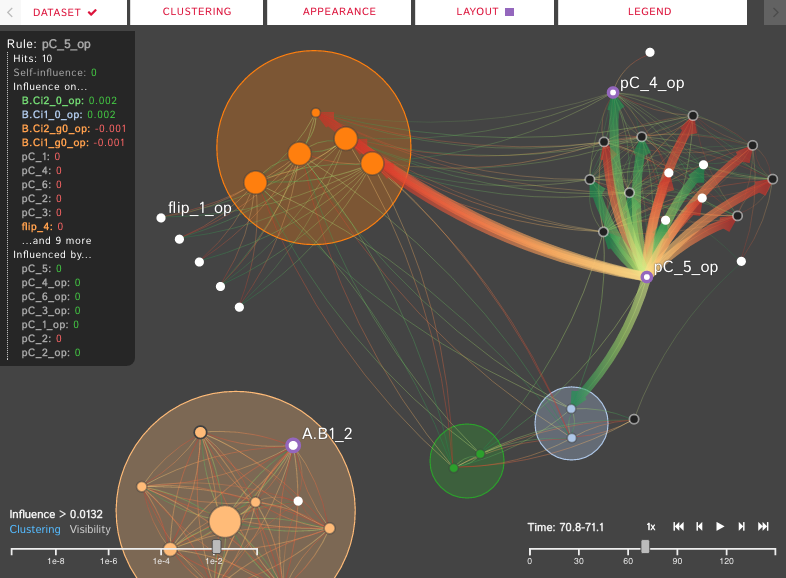 BioLinker facilitates the bottom-up exploration of protein interaction networks. A user can initiate an exploration from a small subnetwork that connected to a particular protein of interest and then iteratively expand the network on demand by choosing individual elements to expand. BioLinker provides multiple views that each display a different aspect of the currently selected subnetwork, such as the contexts of the protein interactions, the publication data related to the discovery of these protein interactions, and conflicts between different interpretations of experiments found in the publications. Each of these integrated views provide important supplementary information through brushing and linking. The BioLinker database currently contains over 3.5 million protein interactions extracted from approximately 290,000 publications and is accessible via our API, located at http://ccrg-data.evl.uic.edu/index-cards/explorer and source code is available at the Creative Coding Research Group code repository. Understanding the causality inherent in networks of biological pathways is an active area of research for systems biologists, cancer researchers, and drug designers. ReactionFlow explores the use of animation within novel network visualizations of biological pathways to enable a number of tasks related to representing and analyzing causality, including: finding components that are downstream and/or upstream from a particular protein or biochemical reaction; finding the shortest path between two proteins in a network or subnetwork; identifying feedback loops within a pathway; and simluating the effect of perturbing the network by “knocking out” a protein or protein complex. This technique, developed by Tuan Dang in collaboration with Paul Murray, Jillian Aurisano, and Angus Forbes, was presented at BioVis’15. Source code can be found at the Creative Coding Research Group’s code repository. BRAINtrinsic is a novel VR-compatible visualization application that enables users to interactively explore the human brain connectome and its intrinsic topology. It enables a user to reconstruct and analyze the intrinsic geometry of brain data, that is, the topological space where the brain connectivity natively resides (independent of neuroanatomy). The utility of this intrinsic geometry could lead to a greater distinction of differences not only in clinical cohorts, but possibly in the future to monitor longitudinal changes in individual brains in order to better deliver precision medicine. BRAINtrinsic was developed by Giorgio Conte in collaboration with Angus Forbes, Alex Leow, Allen Ye, Olusola Ajilore, and others affilated with the Collaborative Neuroimaging Environment for Connectomics (CoNECt@UIC). It was presented at BIH’15 and has been utilized for research appearing in Brain Informatics and Human Brain Mapping. The density of points within multidimensional clusters can impact the effective representation of distances and grouping when projecting data from higher dimensions onto a lower dimensional space. This collaboration from Ronak Etemadpour and Angus Forbes examines the use of motion to retain an accurate representation of the point density of clusters that might otherwise be lost when a multidimensional dataset is projected into a 2D space. We study how users interpret motion in 2D scatterplots and investigate whether or not they are able to effectively interpret the point density of the clusters through motion. Specifically, we consider different types of density-based motion, where the magnitude of the motion is directly related to the density of the clusters. This research was developed by Ronak Etemadpour and Angus Forbes, and first presented at BigData’14 and VDA’15, and then published in the Information Visualization journal. BranchingSets is a novel interactive visualization technique for augmenting node-link diagrams with information about the categories that both nodes and links belong to. Our technique enables user-driven methods to procedurally navigate the graph topology as well as to interactively inspect complex, hierarchical data associated with individual nodes. Developed by Francesco Paduano in collaboration with Angus Forbes, BranchingSets has been applied to biological pathway networks as well as co-authorship networks. The biology pathway network use case was presented at BioVis’15 in Dublin, Ireland, and an evaluation of the technique was presented at VINCI’16 in Dallas, Texas. Studying the behavior of individual members in communities of dynamic networks can help neuroscientists understand how interactions between neurons in brain networks change over time. Visualizing those temporal features is challenging, especially for networks embedded within spatial structures, such as brain networks. Two projects led by Chihua Ma, Animated dual-representation and SwordPlots, provide visual analytics tools to better understand how the functional behavior of the brain changes over time, how such behaviors are related to the spatial structure of the brain, and how communities of neurons with similar functionality evolve over time. The first project was presented at EuroVis’15 and incorporates interactive animated dual-representation of the connectivity between brain regions as it changes over time. The enhanced node-link diagram and distance matrix visualizations are coordinated, each serving as interfaces for each other to better enable visual analytics tasks using dynamic brain network data. The second project was recently accepted for publication in the Journal of Imaging Science and Technology; it provides a novel interactive multi-view visualization system to assist neuroscientists in their exploration of dynamic brain networks from multiple perspectives. These projects are collaborations with the computer scientists Tanya Berger-Wolf, Robert Kenyon, and Angus Forbes of UIC, and the neuroscientist Daniel Llano of UIUC. PathwayMatrix is a visualization tool that presents the binary relations between proteins in the pathway via the use of an interactive adjacency matrix. We provide filtering, lensing, clustering, and brushing and linking capabilities in order to present relevant details about proteins within a pathway network, enabling systems biologists and cancer researchers to find patterns in the relationships and reactions between proteins and protein complexes. PathwayMatrix, developed by Tuan Dang in collaboration with Angus Forbes and Paul Murray, was presented at BioVis’15; source code can be found at the Creative Coding Research Group code repository. Passive wayfinding devices, such as signs, maps, schedules and arrival time displays are essential parts of most successful, modern public transit networks. In contrast with contemporary transit navigation software, passive wayfinding devices accept no input but, rather, instead provide the user with the information needed to make their own way to their destination. In this paper, we describe a new type of passive wayfinding device: a fully enriched animated, ambient display. Our design makes use of a novel animation strategy to aid travelers in route planning tasks. To provide an initial validation of our design choices, we have conducted a pilot study that assesses a usage scenario demonstrating how our visualization can be used to facilitate effective urban wayfinding in the City of Chicago and elsewhere. The prototype application, TransitTrace, was developed by Massimo De Marchi in collaboration with Jakob Eriksson and Angus Forbes and presented at ACM SIGSPATIAL’15. Visualizing and analyzing the relationships between taxonomic entities represented in multiple input classifications is both challenging and required due to recurrent new discoveries and inferences of taxa and their phylogenetic relationships. Despite the availability of numerous visualization techniques, the large size of hierarchical classifications and complex relations between taxonomic entities generated during a multi-taxonomy alignment process requires new visualizations. ProvenanceMatrix is a novel tool allowing end users (taxonomists, ecologists, phylogeneticists) to explore and comprehend the outcomes of taxonomic alignments. ProvenanceMatrix, developed by Tuan Dang in collaboration with Nico Franz, Bertram Ludascher, and Angus Forbes, has been evaluated on taxonomic classifications of various sizes, from a few to hundreds of taxonomic entities and hundreds of thousands of relationships. It was presented at VOILA’15, the ISWC Workshop on Visualizations and User Interfaces for Ontologies and Linked Data. Signal alteration is a well established means for artistic expression in the visual arts. A series of collaborations by Javier Villegas and Angus Forbes explore a range of interactive projects featuring novel video processing techniques on mobile and desktop environments. We introduce a powerful strategy for the manipulation of video signals that combines the processes of analysis and synthesis. After an analysis process a signal is represented by a series of elements or features. This representation can be more appropriate than the original for a wide range of applications, including, for example, the compression and transmission of video signals, or this representation can be used to generate new modified instances of the starting signal. Our Analysis/Synthesis (A/S) approach is general enough to be adequate for the creation of non-photorealistic representations that are not intended to mimic art styles from the past, but instead seek to find novel creative renditions of moving images. Our methods are particularly powerful in interactive arts projects as they enable even drastic manipulations of the input image while still maintaining fundamental aspects of its original identity. Articles describing the theory, application, and evaluation of these A/S techniques have been presented at ACM MM’14, VPQM’14, and HVEI’15. The use of electronic health records (EHRs) in clinical environments provides new opportunities for clinicians to integrate data analyses into their practice. While having access to these records has many benefits, the act of recording, retrieving, and analyzing this data can nonetheless introduce communication issues, as navigating and interpreting large amounts of heterogeneous data can be difficult, and conclusions can be hard to validate. In collaboration with Jane Carrington and Mihai Surdeanu from the University of Arizona, Angus Forbes created a series of integrated visual interfaces to help nurses document and reason about patient data and about clinicians’ understanding of patient data. The interfaces present the output of a predictive algorithm that makes use of historical EHR data, patient vital signs, and nurse handoff reports in order to classify a patient in terms of their likelihood of experiencing clinical events. Furthermore, the interfaces enable the nurses to quickly explore the original data and to examine other nurses’ interpretation of patient activity during previous shifts. This work, funded by the National Institutes of Health as part of the NSF/NIH Smart and Connected Health Program, has been presented at TextVis’13, and an implementation developed by Alessandro Chetta and Angus Forbes was introduced at VAHC’15, and is currently being evaluated in the context of real-world healthcare situations. 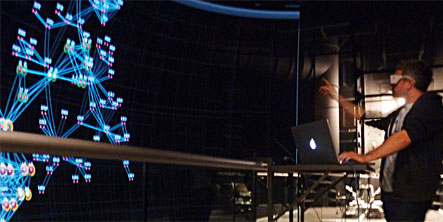 Stretch projections allow users to interactively interrogate multivariate datasets in real-time by “stretching” data into data onto a two-dimensional display. The position of each element is based on a linear combination of variables determined by the analyst. The technique is particularly relevant to geotemporal data, where geography and time interact with a number of other variables. A protoype application, Stretch Plot, was used to visually explore a large dataset related to traveling musicians. Data include the date and geographic location of performances given by over 3000 musicians over the span of four years. In addition, social and demographic data – such as median household income and racial distributions – was collected based on the geographic coordinates of each performance location. The technique was created by Paul Murray in collaboration with Angus Forbes and the StretchPlot application was presented at VAST’14 and MapInteract’14. This collaboration with Saiph Savage and Tobias Höllerer presents a system that automatically classifies social network data in order to support a user’s directed social queries and, furthermore, that allows the user to quickly verify the accuracy of the classifications. We model a user’s friends’ interests in particular topics through the creation of a crowd-sourced knowledge base comprised of terms related to user-specified semantic categories. Using this model, our system makes it possible to quickly identify friends who have a high probability of being able to answer particular questions or of having a shared interested in particular topics. This work was presented at TextVis’12. The Natural materials browser is a tablet application created in collaboration with the materials scientist Tony Fast. The application enables a user to interact with volumetric datasets created from a series of natural materials samples. The data samples— high resolution meso-scale volumetric images of nutshells gathered via micro-computed tomography— are envisioned as “virtual specimens” presented many orders of magnitude larger than their characteristic length scale. The user, initially placed in the center of the volumetric dataset and facing orthogonally toward the original 2D image slices, uses a tablet as a magic lens to view and navigate the data via physical rotation and multitouch gestures. The user has simultaneous access to multiple representations of the datasets from any angle or position, and an additional viewport provides real-time, spatial statistics on the current view of the currently loaded dataset. The Natural materials browser was first presented at IEEE VIS in 2013. Tag River is a visualization that presents a detailed comparative overview between mutiple users’ content within a particular time period; and providing a trend summarization over a range of time spans. The summarization is displayed using vertically-adjacent polygonal regions in which the area represents some facet of quantitative information. A series of animated tag clouds are used to provide more detailed content for each user, changing over time to provide an indication of the coherence of context between time segments. The concurrent representation of both multivariate and temporal data can be cycled though programmatically or navigated interactively. Tag river is a collaboration with Basak Alper and Tobias Höllerer and was presented at TextVis’11. Stereoscopic highlighting, developed in collaboration with Basak Alper, Tobias Höllerer, and JoAnn Kuchera-Morin, is a novel technique that helps to answer accessibility and adjacency queries when interacting with a node-link diagram. The technique utilizes stereoscopic depth to highlight regions of interest in a 2D graph by projecting these parts onto a plane closer to the viewpoint of the user. This technique aims to isolate and magnify specific portions of the graph that need to be explored in detail without resorting to other highlighting techniques, such as color or motion, which can then be reserved to encode other data attributes. This mechanism of stereoscopic highlighting also enables focus+context views by juxtaposing a detailed image of a region of interest with the overall graph, which is visualized at a further depth with correspondingly less detail. The stereoscopic highlighting technique was presented at InfoVis’11 and later published in IEEE Transactions on Visualization and Computer Graphics. Behaviorism is a software framework that faciliates the creation of new visualizations. It allows a wide range of flexibility when working with dynamic information on visual, temporal, and ontological levels, but at the same time provides appropriate abstractions that allow developers to create prototypes quickly, which can then easily be turned into robust systems. The core of the framework is a set of three interconnected graphs, each with associated operators: a scene graph for high-performance 3D rendering, a data graph for different layers of semantically-linked heterogeneous data, and a timing graph for sophisticated control of scheduling, interaction, and animation. In particular, the timing graph provides a unified system to add behaviors to both data and visual elements, as well as to the behaviors themselves. Behaviorism has been used to create a wide range of visualization and media arts projects. It was presented at InfoVis’10 and later published in the IEEE Transactions on Visualization and Computer Graphics.